Caudalie’s Eau de Beaute with bottle design by L’Wren Scott. I don’t normally go in for beauty products that seem a little out there but after reading a few reviews on Sephora about this Eau de Beauté by Caudalie, the French skincare company, I couldn’t resist. This is a liquid that comes in a spray bottle that you mist over your face. Some reviewers complained of its scent, which can be more than you’re expecting, it’s true, and it contains mint, rosemary, and orange blossom, for starters, so if you don’t like those essences steer clear of this stuff—and some said this wasn’t a necessity but a fun pick-me-up. Others use it to set their makeup. The reviewer who made me want to try it said she felt it helped with oil control. I’m happy to report she was right! It does seem counterintuitive to spray something on your face when you have makeup on (and of course you have to cover your eyes! ), but I do feel this beauty elixir helps control oil throughout the day whether I have makeup on or not. Who knew? I can’t imagine an American skincare company coming up with something like this, but if one exists, do let me know what it is and which company makes it. 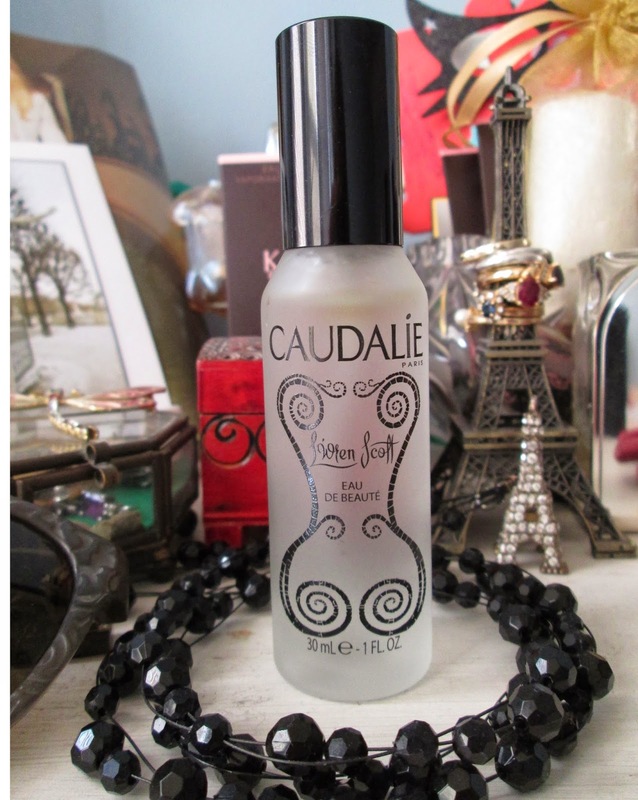 Until then, I will file Caudalie’s Eau de Beauté under “French Beauty Mysteries” and keep misting away. If you would like to see the Eau de Beauté in action, here is a quick video by Caudalie founder Mathilde Thomas, telling a bit about the product and showing its use. She calls it “the Starbucks coffee of the skin.” Love it! I love the artwork on the bottle. The bottle is a limited edition by the late L’Wren Scott, who was a fan of this product. It was released last fall and is still available online at Sephora.The small bottle, which is the one I have, is $18.00. Are there any distinctly French beauty secrets you know of that you can pass along to the rest of us? Do stop by Vintage French Chic to see what Heather is musing about this week for French Friday! I've seen this in Sephora, very tempting. I like the Caudalie products. I actually have a bottle of Bulgarian rose water by Alteya Organics in my fridge that I spritz on. It's so refreshing and smells good too. I guess a cult favorite during Fashion Week was the Evian spray for the face (which is just water!). I could use a new way to control oil. Right now I use a mattifying cream that is a little tackier than I would like.